Ranawara Senna auriculata, copyright J. M. Garg. 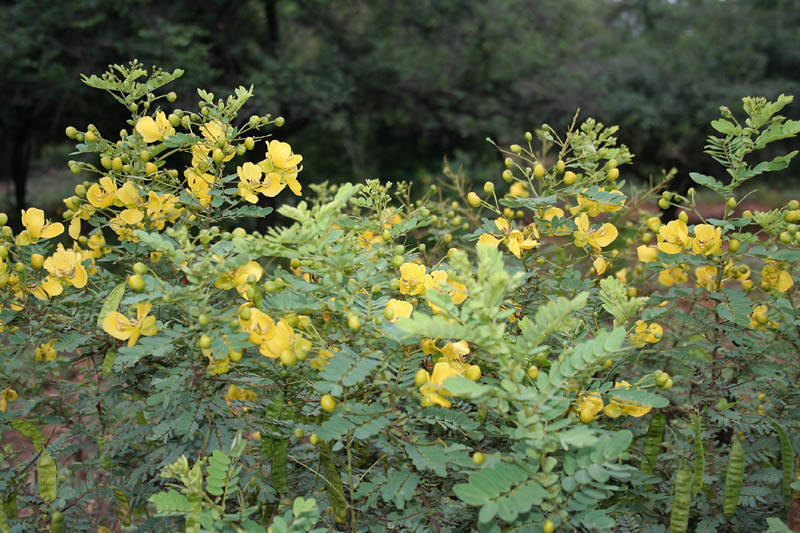 Senna is a pantropical genus of legumes includes herbs, shrubs and trees, most of which produce bright yellow flowers. Characters (from Hickman 1993): Perennial, shrub, tree, unarmed or spines weak. Leaves even-1-pinnate, alternate; stipules sometimes small or ephemeral; leaflets 2–10 (18) pairs. Inflorescence a raceme or panicle, axillary or terminal. Flowers generally slightly bilateral, generally showy; sepals more or less free; petals free, generally yellow; stamens free, 7 fertile, 3 sterile, anthers generally larger than filaments, opening by terminal pores. Fruits dehiscent or not. Seeds few to many. [G14] Gibson, L. A. 2014. Biogeographic patterns on Kimberley islands, Western Australia. Records of the Western Australian Museum Supplement 81: 245–280. [G04] Gibson, N. 2004. Flora and vegetation of the Eastern Goldfields Ranges: part 6. Mt Manning Range. Journal of the Royal Society of Western Australia 87 (2): 35–47. [J07] Jadhav, D. 2007. Ethno-medicinal plants used by Bhil tribe of Matrunda, district Ratlam, Madhya Pradesh, India. Bulletin of the Botanical Survey of India 49: 203–206. [MLP09] McKenzie, N. L., S. van Leeuwen & A. M. Pinder. 2009. Introduction to the Pilbara Biodiversity Survey, 2002–2007. Records of the Western Australian Museum Supplement 78 (1): 3–89.